Standard X12 EDI transaction sets for load tender, invoice, bill of lading, and shipment status are are available for both LTL/400 and AgiliTrans. We also provide support for rail billing and car locator messages. A segment is a single transportation move: door-to-ramp, ramp-to-door, door-to-port, etc. This means that a given lane doesn't have to be defined more than once. Segments are "building blocks". A routing is an end-to-end transportation plan and consists of one or more segments (truckload moves almost always have only one segment; TOFC/COFC moves almost always have more than one segment). The routing entity contains the total of all vendors' costs for the move and adjusted when multiple currencies. To adress rapidly-changing prices, 3PL can build least-cost routings based on lane, equipment size, commodity, customer, effective date, and orther criteria. AgiliTrans is a quote-to-cash enterprise-scale transportation management system designed specifically for the mode-neutral transportation organization, with support for buying and selling LTL, TL, COFC/TOFC intermodal, air, ocean, courier (hotshot), and logistics services. It handles freight bill entry, rating, dispatching, revenue accounting, invoicing, cash application, transportation payables management, EDI, customer service, customer-facing reporting, and internal reporting. AgiliTrans and LTL/400 share common customer, freight bill, and system configuration databases. While revenue accounting processes are shared, operational processes--quoting, order entry, rating, and dispatch--are unique and designed to the specific requirements of 3PL operations. 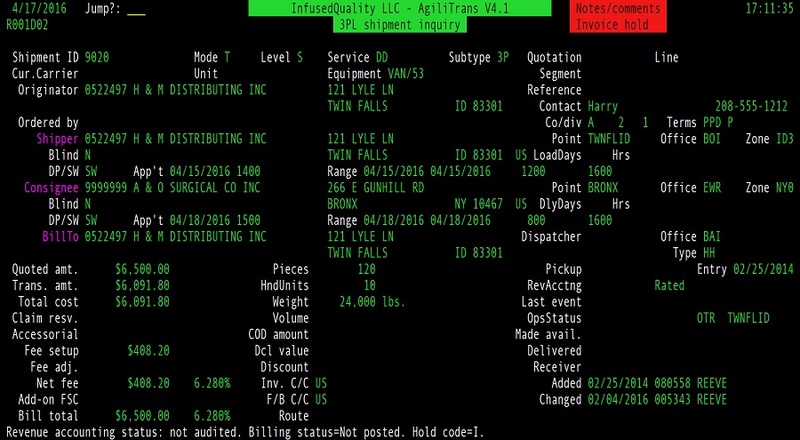 The 3PL shipment inquiry screen was designed specifically for non-asset shipments. It's less focused on commodities, doesn't handle interlines, and more focused on the financial aspects (buy, sell, margin/fee) and on current shipment location and status. Other pages are behind this main page show vendor, revenue accounting, shipment status, and shipment location information from check calls or car locator messages. AgiliTrans has a 3PL-specific pricing database which retains published and quoted rates by vendor, lane, mode of transportation, service level, transit days, and cost. This is a powerful sales and operations tool in that it allows users to research sell and buy prices quickly, even when negotiating with buyers and sellers. The powerful quotation management application supports multiple modes (intermodal, truckload, LTL, air, hotshot, etc.) of transportation on one quotation. For 3PL LTL traffic, we take a different approach due to the complexity of LTL pricing. We handle LTL rate shopping (where multiple carriers' rates and pricing are compared to find the lowest price or best service) by using the very flexible LTL/400 rating engine, which supports a wide variety of local and cloud-based tariffs, lane-specific discounts, lane-specific minimums, lane-specific accessorials, lane-specific truckload and pallet rates, and lane-specific fuel surcharges. AgiliTrans was designed to support agent (contracted) sales offices where the users are not employees of the hosting organization. Security provisions prevent agent locations from viewing other agents' business and there are security hierarchies as well. The net result is that these agent locations can share "system" pricing while negotiating the best sell rate possible. Agents also have the ability to enter "private" pricing that's not available to other agents.